Denise Hills is a geoscientist at the Geological Survey of Alabama, in Tuscaloosa, Alabama. She was trained as a marine geophysicist and is currently Director of the Energy Investigations program at the Survey. Her research, often federally funded, focuses on energy resource assessment. This includes traditional and unconventional hydrocarbon assessment, non-hydrocarbon geologic energy sources, and geologic carbon sequestration. 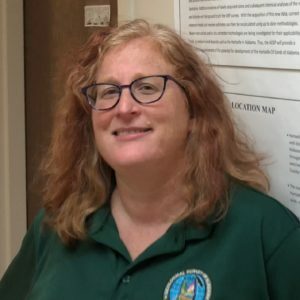 She also leads much of the data rescue and data preservation efforts at the Survey, focusing on the geological cores collected throughout the state in relation to over 100 years of hydrocarbon research in the state. Denise enjoys helping people understand scientific research and its impact on their day to day life. Denise has been actively involved with ESIP since 2012, serving in various roles including meeting session chair, member of the Constitution and Bylaws (now Governance) and Partnership committees, and chair of the Nominations and Visioneers committees. She looks forward to continuing her service to ESIP as chair of Governance.